Scientifically developed for Goldfish. The protein-to-fat ratio in this pelleted high-quality marine protein diet is designed to support normal growth and helps maintain clean water. Contains no artificial colors or dyes that can harm fish or cloud water. Made in the USA. 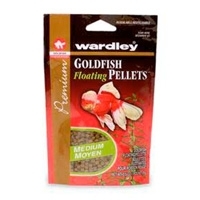 Wardley® takes care of the science so you can enjoy your fish.